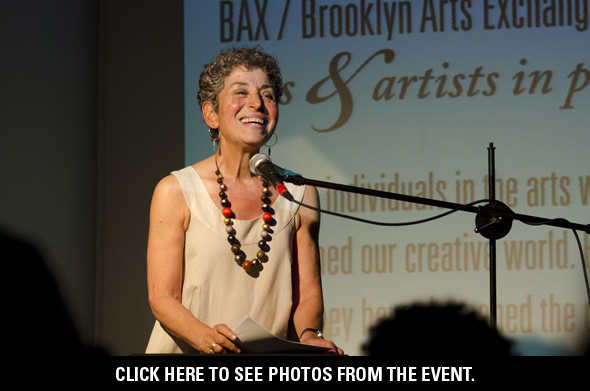 On May 5th, 2012, we celebrated the 11th BAX Arts & Artists in Progress Awards. If you were there you know that awardees, Jon Kinzel, Nicky Paraiso, and Pat Hall, embody the values that BAX has as artists, arts leaders and arts educators. The heart and soul of the awards were evident with the choices our awardees made to “pass it on to” — revered teaching artist Pam Patrick, Paz Tanjuaquio & Todd Richmond co-founders of Topaz Arts Inc. in Queens, and the Co-founder of the legendary video house Character Generators, Mark Robison. You can still make a tax-deductible donation in the Awardees’ honor. Click HERE and fill-out the donation form. “Good evening everyone it’s great to see you. My name is Marya Warshaw I am the founder and Executive Director of BAX. Welcome to our eleventh annual BAX arts and artists in progress awards. Some of you have heard me explain that these awards were created when BAX was turning 10 in 2001. The shock of that year made coming together deeply meaningful and personal. We looked inwards and reflected on BAX’s tenacious support of artists, the value of a safe, nurturing space to develop new work and new ways of working. We talked about what goes into supporting student and professional artists in taking risks, even making mistakes. All of these characteristics were utilized in the creation of this award. And so, we designed an award that honors individuals in the arts who have revealed and transformed our creative world. By instigating and enduring change they have deepened the definition of their field and paved the way for others. There are other awards for artists given by other organizations. So in 2012 when I ask why are these awards still important the answer, for me, is that if these qualities – endurance, transformation, integrity were commonplace we wouldn’t need to be reminded of what we value and why we value it. Over 11 years and in this post 9/11 era artists, arts organizations and arts education have been battered politically and economically. We have seen a rise of hateful rhetoric that attacks the very creativity we honor as unessential, a perk rather than a human necessity. And yet, arts and artists provide us with magnificent examples of how to find meaning for ourselves and connect authentically to others. To think big, to craft non-traditional work and lives. To create theater that gives us a deeper and richer understanding of ourselves and others. In 2004 I commented that the news of the world would lead us to think we live in insanity. Well, we did and we do. We are inundated daily by spin, half-truths and manipulation. I find meaning and truth with fellow artists who live and create remaining true to themselves and then pass it on to others. This is the kind of work that eleven years of awardees share in common. They teach us the importance of creating and sustaining artistic homes, the power of arts education and the value of pioneering new and radical ideas. The three individuals we honor tonight — Jon Kinzel, Pat Hall and Nicky Paraiso — are very different from one another. They are all artists. One is best known as a passionate, life changing teacher. Another as being the artists’ best advocate, curating and presenting with the artist and their work at the center. And yet another who choreographs with breathtaking experimentation and is treasured by other artists for his support and encouragement. They share a lineage with a remarkable list of artists, arts educators and arts leaders who received the BAX arts and artists in progress award in previous years. Glorious artists Gus Solomons, Tere O’Connor. Yasuko Yokoshi, Deborah Hay, Dean Moss, Pamela Sneed, Judith Sloan, Carl Hancock Rux, Clarinda Mac Low, Elizabeth Streb, Meredith Monk, Jennifer Miller, Reno, Marlies Yearby, Hank Smith and Peggy Shaw. Inspiring arts educators including Terry Greiss, Edie Demas, Reg Flowers, Jessica Nicoll, George Emilio Sanchez, Denise Jefferson, Sharon Dunn, Andrew Jannetti, Joan Finkelstein, Kwayera Archer-Cunningham, David Pleasant, Jackie Chang, Martha Bowers, Ana Maria Alvarez, Sandi Stratton-Gonzalez and Greg McCaslin. And the visionary, steadfast leadership of Leslie Strongwater, Jen Abrams, Ruby Lerner, Karen Bernard, Bob Yesselman, Kristin Marting, Norma Munn, Maurine Knighton, Craig Peterson, Martha Wilson, Nathan Elbogen, Ellie Covan, Ginny Louloudes, Steve Gross and Mikki Shepard. That is an impressive line-up. But no more so than the three individuals — who you will hear about tonight and the three individuals they have chosen to pass it on to. PASSING IT ON may be the heart and soul of these awards. We ask each awardee to choose someone or a project or an organization that they value to pass it on to. Awardees are asked to think about some of the qualities they were chosen for and where they see those qualities reflected in others. Jon Kinzel is a choreographer based in New York City who straddles both traditional and contemporary practices of dance, taking cues from performance, conceptual and identity-based art. He has gained national and international exposure with the production of over 30 pieces, numerous commissions, residencies and solo shows. Kinzel is one of only two artists awarded a Martha Duffy Memorial Fellowship at the Baryshnikov Arts Center (2009-10). Jon is an adjunct Professor at NYU Tisch School of the Arts’ The Experimental Theatre Wing. Jon Kinzel will be PASSING IT ON to Mark Robison, President & Co-Founder of Character Generators, Inc.
Pat Hall is an internationally acclaimed dancer/choreographer and teacher. Sought after as a teacher and lecturer, Ms. Hall has been an Artist-in-Residence at Cornell University and currently is a teaching artist for Brooklyn Academy of Music in the Department of Education and Humanities. She is also a consultant on their DanceAfrica/Restoration project. Ms. Hall is an adjunct professor at the Tisch School of the Arts at New York University. Pat Hall will be PASSING IT ON to Pamela Patrick, Teaching Artist. Nicky Paraiso is currently Director of Programming at The Club at La MaMa and is also Co-Curator for the annual La MaMa Moves! Dance Festival. He has been an actor/performer in the NY downtown theater, dance and performance scene since 1979, working with Meredith Monk & Vocal Ensemble, Jeff Weiss and Carlos Ricardo Martinez, Yoshiko Chuma & The School of Hard Knocks, Anne Bogart, among many others. Nicky’s one-man shows (including Asian Boys, Houses and Jewels and House/Boy) have been presented a La MaMa ETC, Dixon Place, BACA Downtown, PS 122, Dance Theater Workshop, Pillsbury House Theater (Minneapolis), the 4th Int’l Festival of Cabaret (Mexico City), the KO Festival (Amherst College), Dublin Theatre Festival and the Initiation Performance Festival in Singapore (both in 2007). Nicky Paraiso will be PASSING IT ON to Todd Richmond & Paz Tanjuaquio, Co-Founding Directors of Topaz Arts, Inc. Please make sure we have your up-to-date contact information. Click on one of the following icons and connect with us. And feel free to leave a comment/message/note for BAX or any of the awardees.